Louisville-metro plan at a press conference. CLARKSVILLE, Ind.  "Finally, we can take down that sign that says, 'No Bridge to Kentucky,' " said Indiana Gov. Frank O'Bannon (D), standing on the banks of the Ohio River. "Building two bridges and rebuilding Spaghetti Junction is the only option that provides adequately for long-term traffic volumes and that results in an efficient transportation system for the region," said Kentucky Gov. Paul Patton (D), with the Louisville skyline rising in the background. "Gov. O'Bannon and I are united in this recommendation and confident that it is the right decision." In a show of cross-state collaboration, the two governors had come together to build bridges over Bluegrass-Hoosier waters. Standing abreast, O'Bannon and Patton were unveiling a joint US$1.4-billion proposal to build two bridges linking Kentucky and Indiana. The Jefferson Bridge (pictured) that carries I-65 traffic is already over capacity, and the metro's two other bi-state bridges will soon follow suit, transportation officials say. 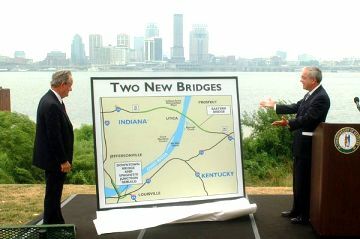 The two governors symbolize a bi-state coalition that's working to unclog the sluggish transportation flow between the two states that comprise the Louisville, Ky., metro (www.greaterlouisville.com). Of the metro's three connecting bridges, the Kennedy Bridge (which carries I-65 traffic) is already well over capacity, transportation officials report. And the two other bridges linking Indiana and Kentucky are expected to exceed capacity by 2015, they say. If implemented, the proposed $1.4-billion solution would be the largest transportation project that Indiana (www.state.in.us) and Kentucky (www.kydirect.net) have ever jointly undertaken. But many smaller bridges must still be crossed before the ambitious plan becomes reality. Money and politics will likely be the most tricky to traverse. A new downtown bridge immediately upstream from the Kennedy Bridge: The new bridge would carry six northbound lanes across the Ohio, freeing up the Kennedy Bridge to carry six southbound lanes. A second bridge some eight miles (12.8 km.) to the east, linking Kentucky State Highway 841 to Indiana's Lee Hamilton Highway (a.k.a., State Road 265): Currently, there is no bi-state bridge connection east of downtown, a hotspot in recent years for residential and commercial growth. 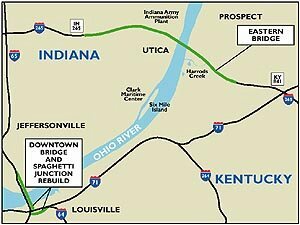 The rebuilding of "Spaghetti Junction," where I-65, I-64 and I-71 converge downtown near the Kennedy Bridge's base: The often congested intersection's accident rate is nearly twice the norm on Kentucky's interstates, transportation officials said. The proposed plan would totally rebuild the interchange farther south. Planners analyzed rebuilding the junction at its present location, but abandoned the idea to provide "a permanent fix," said Patton, who chairs the National Governors Association. The easternmost proposed bridge across the Ohio (pictured at the top of the map above) would most benefit Indiana, while Kentucky has the most to gain from the downtown bridge (pictured lower left in map). Significantly, the proposal has the strong support of both U.S. Rep. Anne Northup (R-Louisville) and U.S. Rep. Baron Hill (D-Southern Indiana), whose constituencies will be affected. Both have been vocal proponents. Local legislative backing will be critical in trying to secure funding on Capitol Hill. Northup, in fact, is a member of the powerful House Appropriations Committee. Politics, however, could create a stern test for the cooperation and diplomacy underpinning the plan. Jack Conway, Northup's Democratic challenger, recently said the downtown bridge should be the first priority, The Louisville Courier-Journal reported. Conway's rationale, according to the report, was the improbability of securing funding to build both bridges simultaneously. Conway, who's endorsed by the Greater Louisville Group Sierra Club, was later criticized in a Courier editorial. Conway quickly responded in letter to the editor, saying, "I support constructing both bridges simultaneously, and as a member of Congress, I will work diligently to ensure both are funded and built." His quoted comments were "a result of my being forthright with your reporter and answering hypothetical questions," said Conway, who earlier served as Patton's deputy cabinet secretary. Even without political squabbling, though, getting full federal funding could still be tough. So far, $42 million of the projected $1.4-billion cost has been secured. Moreover, officials from both states will face a sizable quandary if Congress decides that the federal coffer can only initially fund one of the bridges. Simultaneous building was integral in generating broad support, since each bridge would better serve one of the two states' needs. The easternmost bridge, for example, would benefit Indiana more, creating an economic development catalyst for the Hoosier side. Kentucky, in contrast, is much more interested in the downtown bridge to ease traffic woes. Both governors stressed the need for simultaneous construction. "Two bridges have been part of the transportation plans for this region for many years. We want them to be built as one project," O'Bannon said. The project also faces some opposition from conservation and anti-sprawl groups. One of them, Louisville-based River Fields Inc. (www.riverfields.org), backs downtown bridge and connector construction. But the group, one of the oldest U.S. river conservation organizations, questions the need for the eastern bridge. Eastern bridge construction along Kentucky's river banks would run through Drumanard Estate, listed on the U.S. National Register of Historic Places. The planned construction, Patton explained, would build an 1,800-foot (546-meter) tunnel under the historic property. The eastern bridge, other groups charge, would create development-driven sprawl, particularly on the Indiana side. A final project environmental impact statement will be published this fall. The project planning team - which includes officials from both state transportation departments and the Federal Highway Administration (FHWA) - said that it had solicited broad public input. Planners said they've held a number of large public meetings, as well as another 300 meetings with specific individuals and groups. State transportation agencies have also reviewed the nearly 5,000 public comments submitted on the plan. The proposal includes some elements designed to reduce auto travel, O'Bannon and Patton pointed out. The governors recommended a cross-river bike and pedestrian path on the eastern bridge, as well as additional cross-river bus service. The proposal still has miles of time to go before it sleeps. The states must still make their recommendation, which will include the environmental impact statement, to the FHWA. The agency is expected to make its final decision by year's end on what and where to build. And Congress must still fund the FHWA's decision. Once funding is secured, final design and right-of-way acquisition will likely take two to three years. Construction would take 10 another years, project planners estimated. sf0826bsf0826b ©2002 Conway Data, Inc. All rights reserved. Data is from many sources and is not warranted to be accurate or current.